On my just-concluded trip to New York City, Chicago and Los Angeles, I indulged myself in food and drink on a truly Lucullan scale. One restaurant we visited, Machiavelli on Manhattan’s Upper West Side, was the destination for my stepmother’s birthday dinner. From the outside, one might be excused for mistaking it for one of the dozens of neighborhood Italian joints which come and go every few years. But Machiavelli aims to set itself apart in a few ways. [Andrea Fiano] grew up helping his mother make pasta the traditional, hand-made way. He studied with a master pasta chef to perfect the craft of pasta making and worked for many restaurants in Italy. Watching him at work is fascinating. He adjusts the pasta dough, depending on the weather and humidity. He can feel what the dough needs, working it with his hands. He then masterfully rolls the dough into “sfoglia,” huge sheets of uncut pasta. Finally, he cuts, fills, shapes and forms the pasta for Machiavelli guests to enjoy. Secondly, the place just flat-out looks amazing. 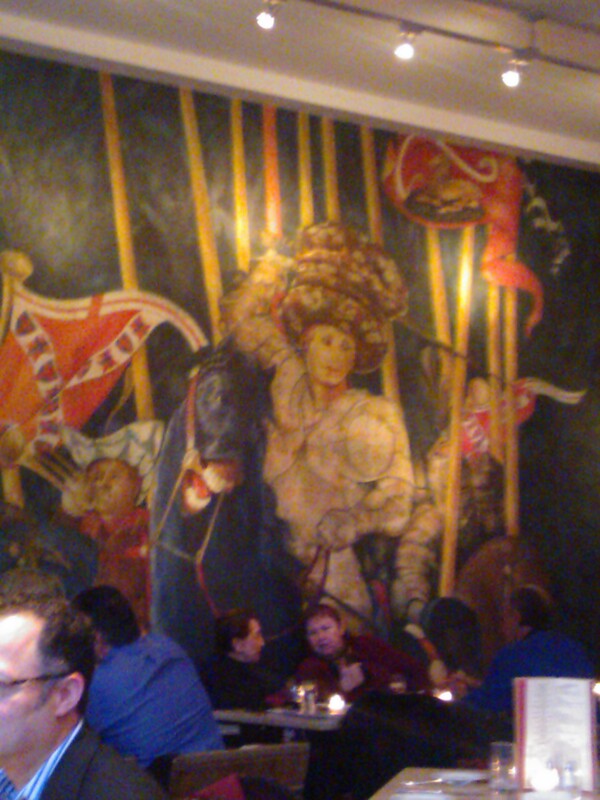 Machiavelli’s singular design feature is the enormous Sienese-inspired fresco-looking murals on the walls. I don’t normally judge art on how it blends with the décor, but the murals were gorgeous to look at and added a perfect grand (but not grandiose) touch to the festive interior. The menu credits not only the artist, but an ironworker, potter and upholsterer who created the interior fittings. Normally stuff like this sets off my BS detectors something fierce, but I can’t complain about the outcome: an elegant yet comfortable space that was inviting as well as visually stunning. 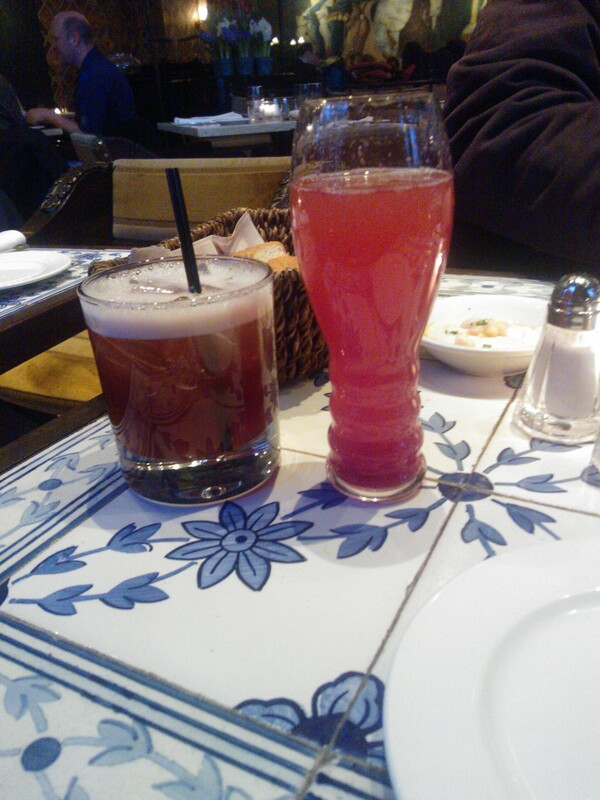 The cocktails were nifty and imaginative: a “Vesuvius” (jalapeño tequila, fire bitters and pineapple juice) and a “Botticelli” (Prosecco, limoncello and blackberry purée). I’ll repeat: meat and fried bread. I couldn’t complain about this if I tried: indeed I could quite happily eat it for every subsequent meal of my life. The pastas, of course, were the test: did Maestro Fiano know his trade, and is it a justifiable expense for a restaurant to hire a sfoglino to craft the pasta in house, by hand? The answer is a resounding HELL YES, if they want to serve the most blissfully perfect pasta I’ve yet had in a restaurant. 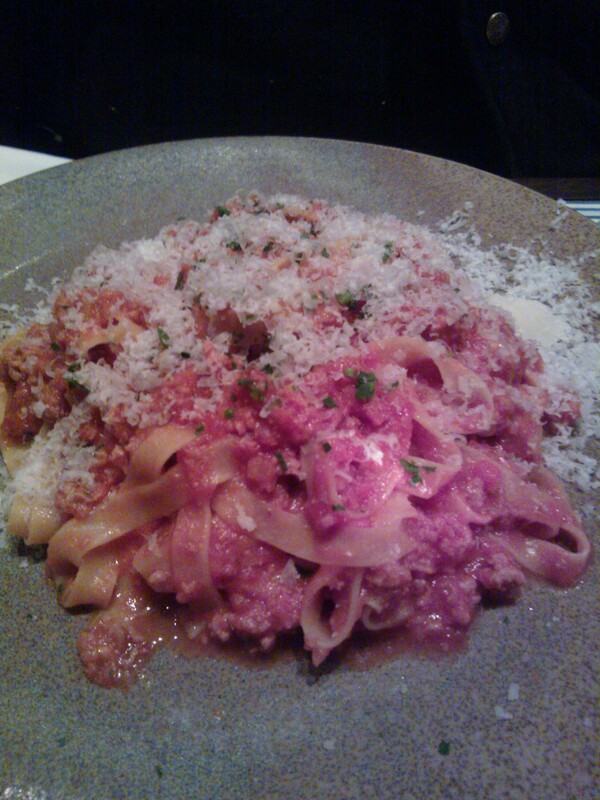 Below is a photo of tagliatelle with a veal ragú. It looks pretty standard, but pictures can’t capture the perfect chewy/firm al dente-ness of the noodles. The ragú, unlike many Bolognese sauces, wasn’t over-spiced but had a gentle savoriness to complement the meat. A perfect example of a dish that is usually taken for granted in thrown-together home versions, given the elegant touch it deserves. 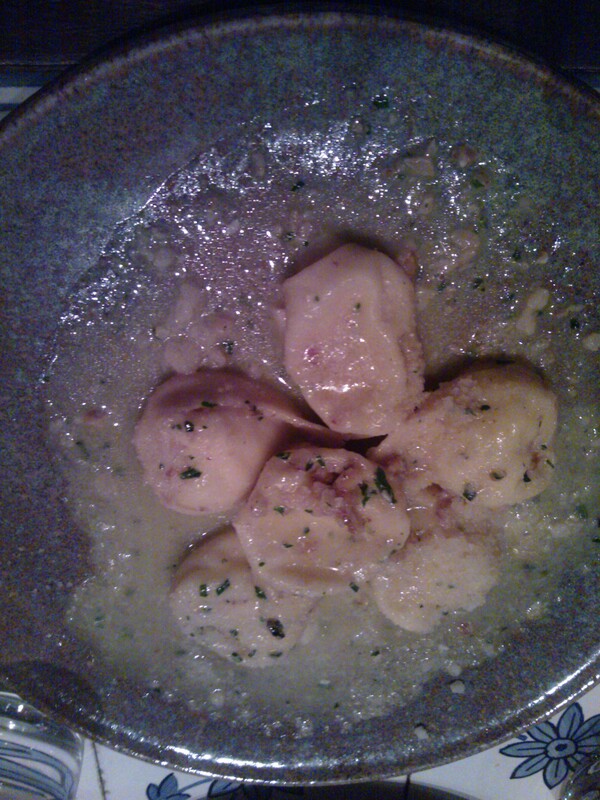 The other pasta entrée was a tortelloni alla Resca, filled with three cheeses (buffalo mozzarella, ricotta, and smoked scamorza) lightly dressed with a garlic butter and studded with walnut pieces. The dish indeed contained only six tortelloni, which as it turns out was a perfect amount. Once again the pasta was nicely toothsome, although the cheese filling did amusingly squirt out like toothpaste when cut with a fork. The smokiness of the scamorza did well to cut the richness, with the faint garlicky saltiness of the sauce providing additional flavor contrast. The walnuts gave a welcome hint of crunch and texture. I can say without reservation that Maestro Fiano and chef, Peter Graziano know their flourstuffs. 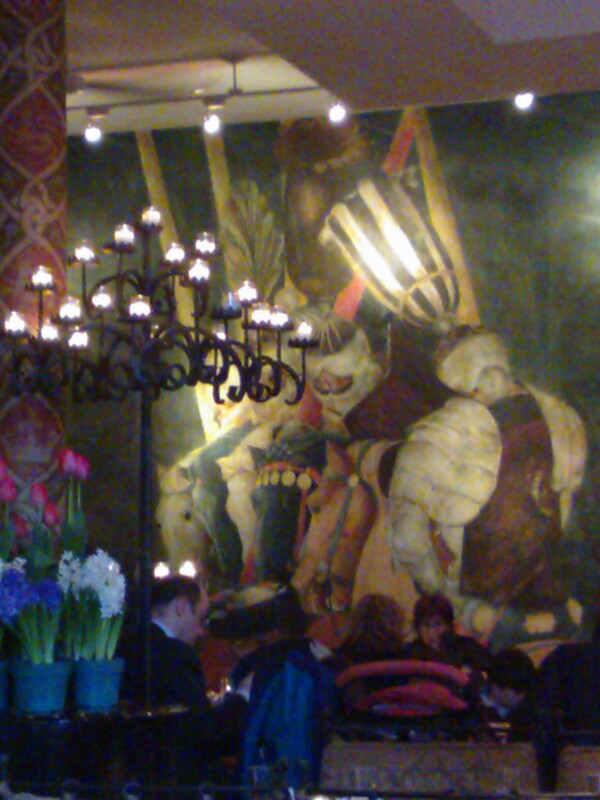 Machiavelli is a most delightful place to experience the sfoglino‘s art if you never have. More USA food and drink posts coming soon. 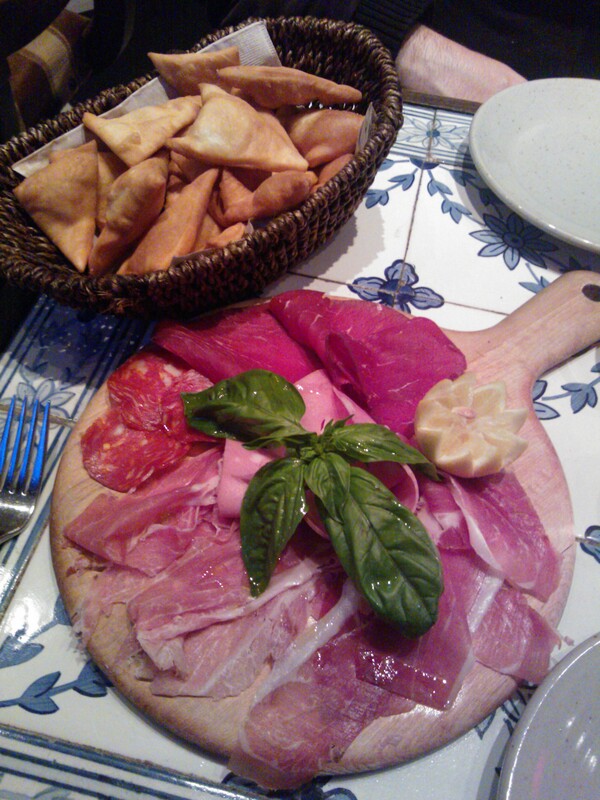 This entry was posted in Food and health, Personal reflections, The Good Life, Travel and tagged Italian food, New York City, pasta, restaurants. Bookmark the permalink. Looks like I’ll have to cheat on Celeste, my usual Upper West Side Italian restaurant. Thanks for the tip!